The update is the creation of clothing to a diverse range of products, obsolete. Update - so don't just facelift the product, and manufacture a new fully meeting all the requirements of fashion. Updated the product must not be worse made from new fabrics. It should be - modern design, original combination of fabrics and materials, and interesting finishing. Upgrade options can be varied. In each case the approach should be especially individual and, of course, creative. 1. What products need to be updated? 2. Is it possible to update them without changing the range so that the jacket remains jacket and dress - dress, etc.? 3. If so, what areas need changes to the product became modern? 4. If you need a complete seal, which product can be obtained from this old cut? 5. What old items can be grouped according to color, texture, threads to get more interesting new? 6. What fabric or material is best to use for product design, if the main fabric enough? 7. What is the most successfully finish accentuate the character of the product and link-layer fabric? To help address these questions, a closer look at possible upgrade options. Update without overlapping. This option is possible if the updated product in its form still corresponds to the direction of fashion. It is, as a rule, products not old, but quite worn and had time to get bored. To upgrade these products can be items of fashion shape, made of fashionable fabrics and materials. Often it is finishing collars, fashionable shapes, a stitched removable or allocated to the product color or interesting embroidery, braid, lace (Fig. 67, 68, 69, 70, 71). Possible options collars, crocheted from wool and silk or originally the United by the pattern of soutache, rolica tape (Fig. 72, 73, 74). Complete with collars can offer cuffs, made in the same technique. Good complement and update the product with different width and configuration of the belt (Fig, 69, 74, 76). 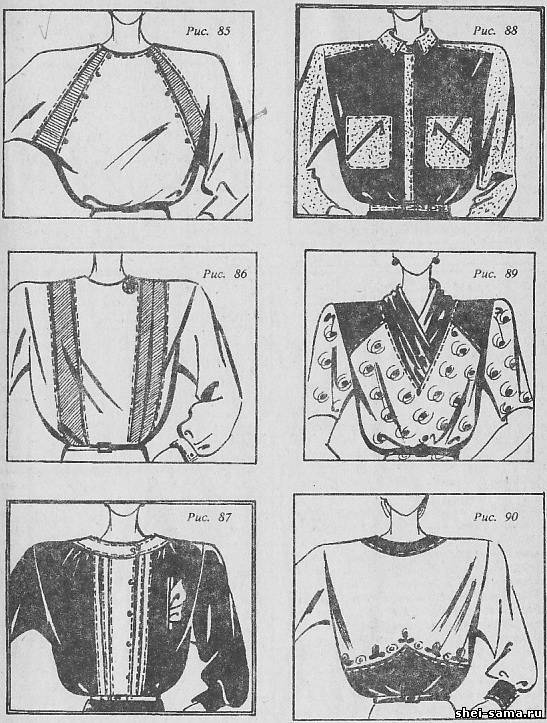 Simplified dress or blouse to complement embroidery. Most often it is appliqued removable or performed on the product, gadjeva embroidery in the form of color spots on the shoulder, the bodice, the sleeve (Fig. 76, 77). Fancy dress can add decorative flower, scarf (Fig. 75), an interesting vest fashion fabric, quilted on batting, or synthetic fleece (Fig. 78). Upgrading from a partial block. Fashion is fleeting. But in recent years it has become more democratic and diverse. Proposed forms of volume and approximate shape, long and short. Products of a large amount closer to the figure not difficult. - Fitting more difficult to make a volume. In this case, the product can "save" if you make some adjustments to the form. Which sites tell the direction of fashion and the mirror. Such an update requires a partial overlapping. Of additional fabric attached for color and texture with updated product, made of individual parts. 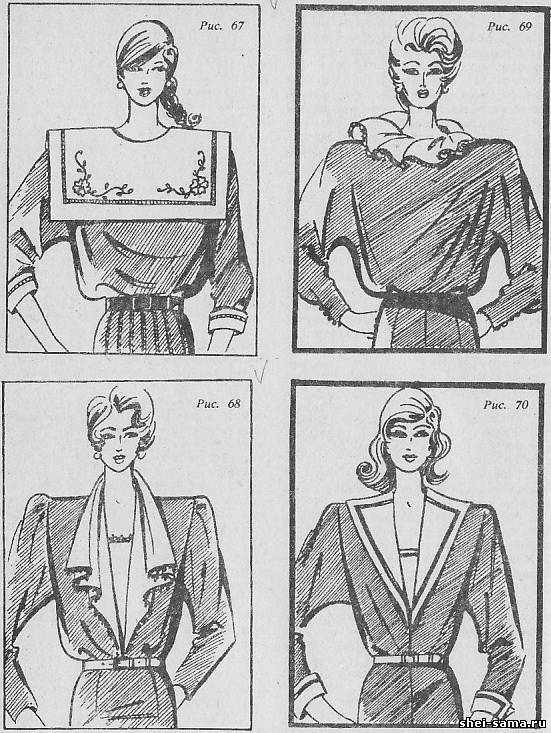 So, to extend the shoulder line is possible by the introduction of various coquettes (Fig. 79), podchaynov barrel (Fig. 80), wide borders on the armhole (Fig. 81). The sleeve will be more modern, if finishing the fabric to change the head sleeve inset panels of various configurations (Fig. 82). Sleeve designs can be completely performed from the finishing of fabric, guipure lace (Fig. 83). From an old long sleeve out sleeve short with the fashionable design of the top part. To update the product with other fashion bags. Cap sleeve a small amount, you can extend the introduction of gussets or pritachivajut finishing strip of fabric to the bottom of the cut sleeves and the bodice (Fig. 84). This technique simultaneously increases the bodice in volume. Shape sleeve Raglan will change padrauna strip of fabric or knit, is inserted in the seam vrachevanie sleeve (Fig. 85). This technique will allow you to extend the shoulder line and to deepen the armhole. Lengthen the sleeve cuff finishing. If the old product is too narrow, a tight bodice, this deficiency can also be corrected. To make it surround you pokrainini barrels, vertical panels or reliefs in the center of the bodice (Fig. 80, 86, 87). The blouson bodice can be completely cut out of new fabric, and finishing details to otkroite from the old (Fig. 88). To create the overlap on the bodice should be lengthened. Options such updates may be different. 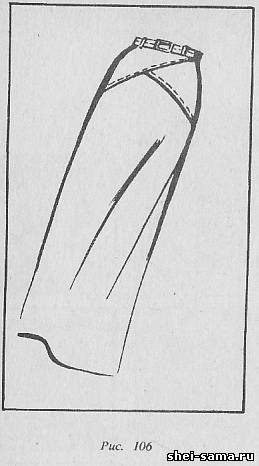 The bodice can extend the wide yoke (Fig. 89). But if you insert the yoke will drop and armhole. Lowering the armhole will require a wider head sleeve. In this case, the sleeve can be reshaped in a short desired shape, insert shape insert in the crown of the sleeve or to completely carve out a sleeve of fabric finishing. (Fig. 91). An interesting variant can be obtained using a wide casting belt in the waist line. It can be cut out of the fabric, knitted fabric or simply dobesilate manually on the spokes. Waistline additionally it is necessary to emphasize a narrow waist (Fig. 92). An important element of fashion is the length. Most rational lengthening dresses and skirts finishing strip on and turned. Options for the location of the bands can be varied (Fig. 93). This method of lengthening can be predloziti in products for summer holidays and in the products made by folk motives. Modern fashion allows you to approach the elongation of new. A narrow skirt will lengthen a stitched flounce and flared, gathered or laid in folds, pleats and corrugation (Fig, 94). This option gives the skirt a movable modern form. To extend the hem of a narrow skirt can mortise wedges the year (Fig. 95), symmetrical and asymmetrical inserts with a group of folds, active Assembly (Fig. 96). So updated products obsolete. But if the legacy product is made of sturdy cloth, rubbed on a Board, collar, netcam sleeves, pockets and bottom of the garment, it is also possible to update a partial block. In this case, can not do without the fabric finishing. Faded loop and the Board will hide the plank of various lengths (Fig. 97), slip the plastron (Fig. 98). 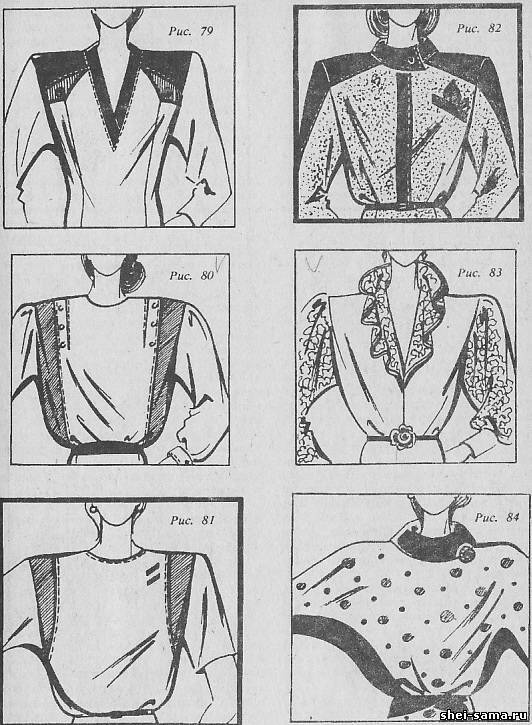 The sleeve cuffs are updating, wide and narrow borders, edges (Fig. 99). Collar, cut from fabric finishing, not only eliminate the fading, but will lend a fashionable look, because the collars in contemporary fashion are the main focus of the design. 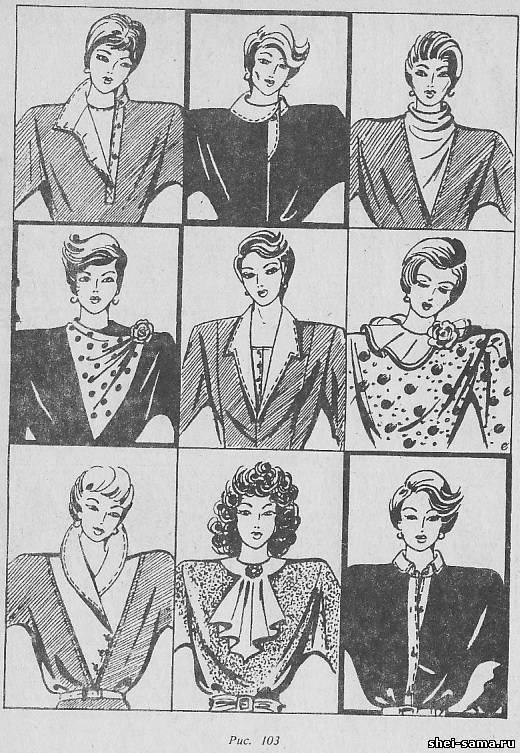 In the fashion of high collars and voluminous-front, wide collars, with rolled cuffs, flat, rounded or straight shape. Recent years, special attention is given to collars, asymmetrical, layered, contrasting color and material.Still in fashion collars British style long soft chalk. 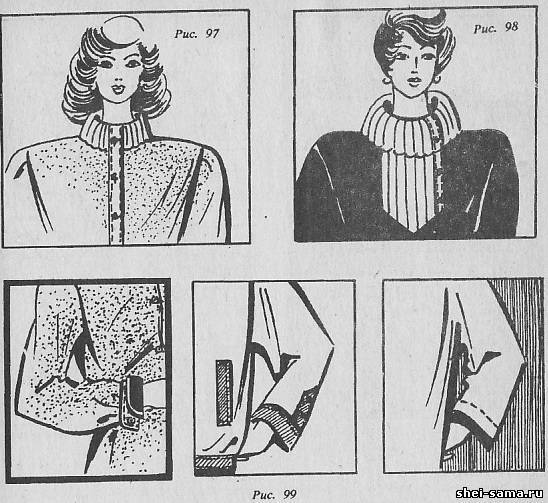 In jacket, jackets, shirt collars can be large. Dresses remain the collars are small and medium in size. 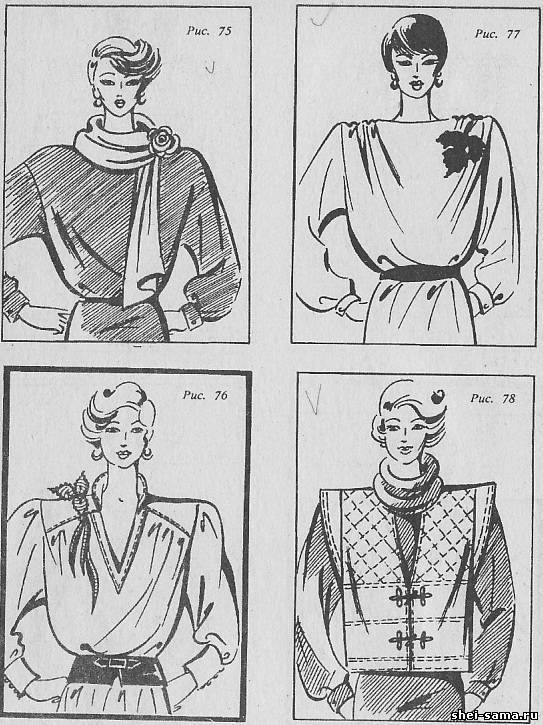 In figures 100-103 proposed various variants of collars, fashionable shapes that you can use during the upgrade. Along with this fashion offers products without collar. In this case, the neck can be issued a finishing binding edging. Important role in upgrading plays and such detail as the pocket. The place where the old Welt pocket, close pocket overlay, contemporary forms and proportions. To the product of the classical style is more suitable to pocket simple form. Sportswear pockets are a very important design element, and it is good if they stand out on the product the color and texture of a finishing material. 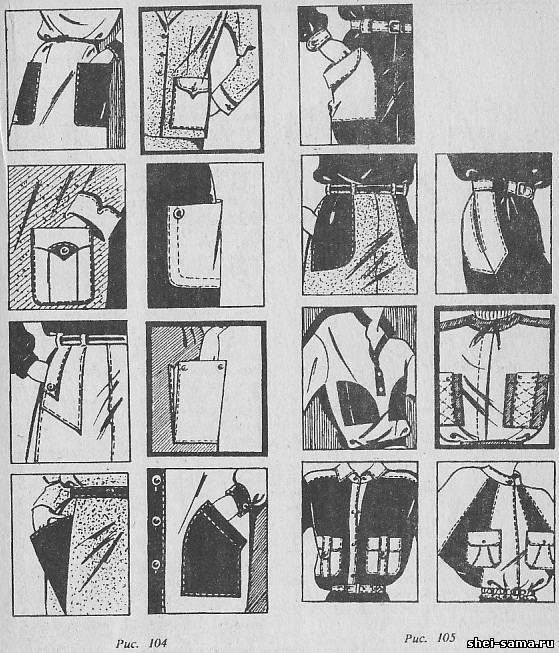 Pocket form proposed for products of sports style can be varied - square, triangle, oval.The fashion variety of three-dimensional structures of pockets of the type of envelope, portfolio, accordion, gathered at upper edge. Design pockets sports style can be fractional with a variety of articulations. 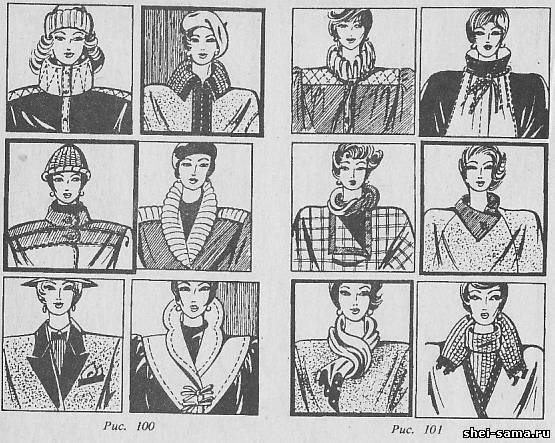 In figures 104, 105 and pockets of classic and sport styles, fashion, shapes and designs. If the product rubbed her bottom, it can be turned over, to issue binding of various widths. Finally, the partial update block without changing the range of possible and without the fabric finishing. This is particularly the case when some parts cut updated products have a significant amount. Great opportunity to update dresses and dresses-costumes gives the pleated skirt in the Assembly. If the skirt to make a straight, narrow, the remaining tissue can be used to update various sections. For example, from the remaining tissue can be cut out flounce and lengthen the skirt. 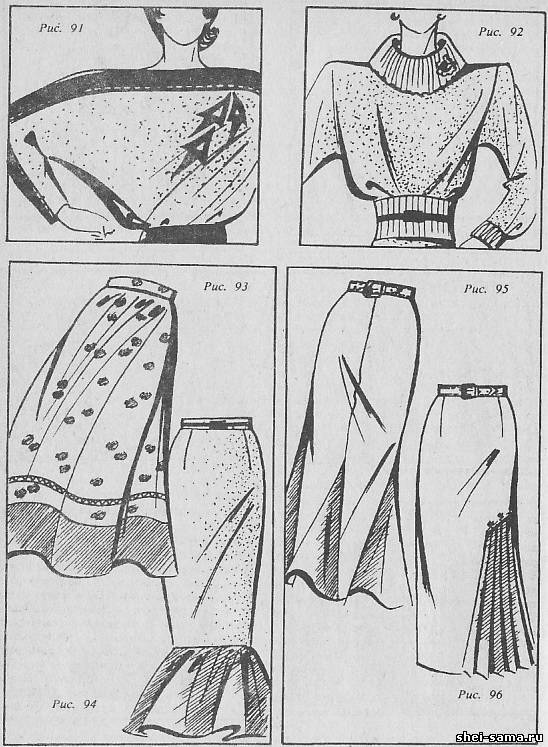 Skirt can be lengthened and the introduction of the notched yoke (Fig. 106). Remnants of fabric can be used to update the shape of the bodice and sleeves for the manufacture of fashion items. If a long sleeve dress or dress-suit to redraw in short, the remaining tissue will come in handy for small parts. 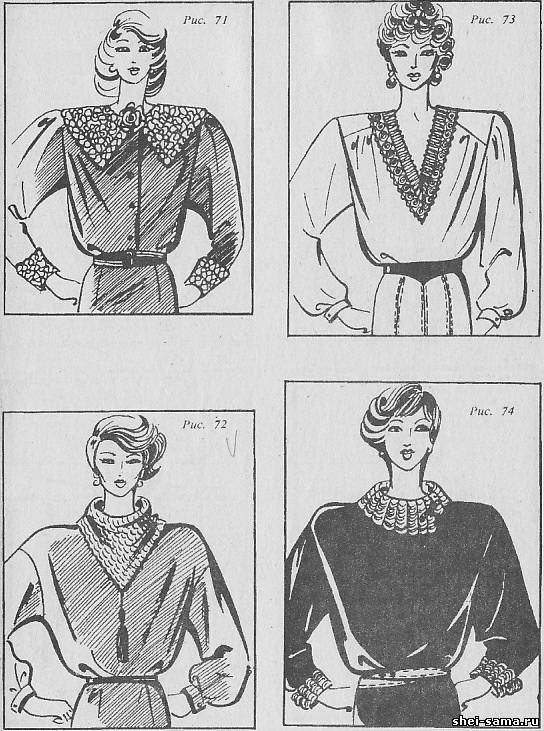 Large collars can be reshaped into a modern design. Dresses-suits when upgrading clarified in the proportions. 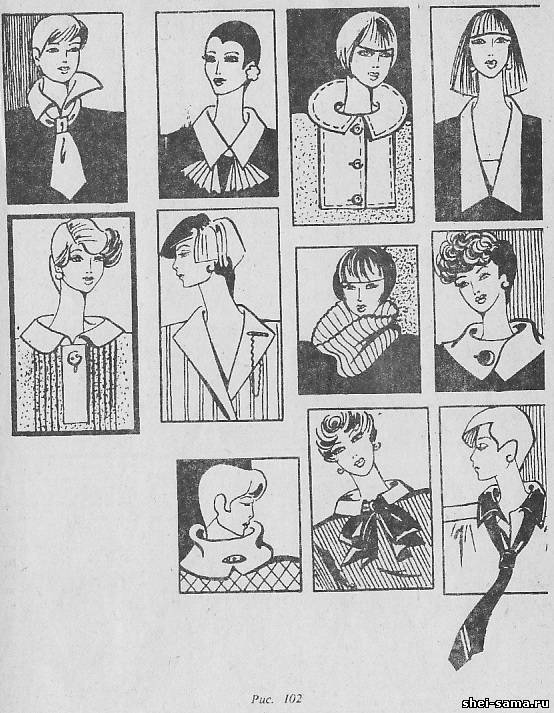 Modern fashion allows the jackets and skirts of various lengths, and various silhouettes. This capability can be used in the manufacture of dress suit new fashionable proportions. Long jacket easy to shorten, wide skirt to lengthen and make narrower. In all other cases it is necessary to use additional finishing materials. When placing the products details you need to remember; that all the finishing details and methods of design should be in each case are linked together in style, character, color.